The hustle and bustle of Christmas Shopping is a major part of Christmas I feel, whether it's braving the supermarkets on weekends or finding out your late night opening times and managing it all kid free. Some love it, some loathe it but I'm sure everyone has done it at one time or another in their lives, so can completely relate. I'm kind of in the middle of the spectrum, leaning more towards online shopping year after year, yes that could be the fact we are completely in the digital age, or could it be that I just don't have the patience for taking shopping publicly at this time of year? Today for Blogmas, I'm speaking to you about the reasoning behind just that, and why for me this year I've definitely been a google girl rather than hitting the high-street. The aisle pushers - You know those people who like to stand seriously close to you looking at the items that you are. The people that make it plainly obvious they want you to move the hell out of their way because their shopping is just that little bit more important? Yeah, I usually end up pretending I wasn't interested and wandering off up the aisle as the pressure is too much, they're rushing me and I can't deal! Car parking - I just can't. I hate it, not so much if it's just me, I can be cool, calm and content, circling car parks for 30 minutes finding a space. But when trying to juggle a screaming baby and a whiny toddler, it just isn't fun. Especially when you're limited as to what spaces will allow you to negotiate both out of the car without dislocating a body part. Slow coaches - Yes a little bit contradictory to item one, but come on, you've been stood looking at the gold baubles for 23 minutes, MOVE ASIDE, I don't want to be the rude lady above and pressure you to move, but there is only so long I can stare aimlessly at the red stuff whilst waiting for you to move. Maybe you want to look at the red decorations and are doing the same, is this a stand off? Lift queues - One of the main reasons we now use a carrier for P. Noah doesn't need a pram as he's really good at listening and walking, so we trust him on his feet. But dear god above, why do shopping centres make lifts to fit a pram the size of the borrowers in it? We once waiting 15 minutes for a lift, which is a hell of a long time with two smalls in tow, so just ended up risking the escalators. Crowds - Busy shops don't generally bother me, but there are some around Christmas you just cannot move in. If we have to venture into these I usually abandon John with the boys outside as it's just too much, I'm thinking Lush, Card Factory and Argos - it's like a people tsunami in there. 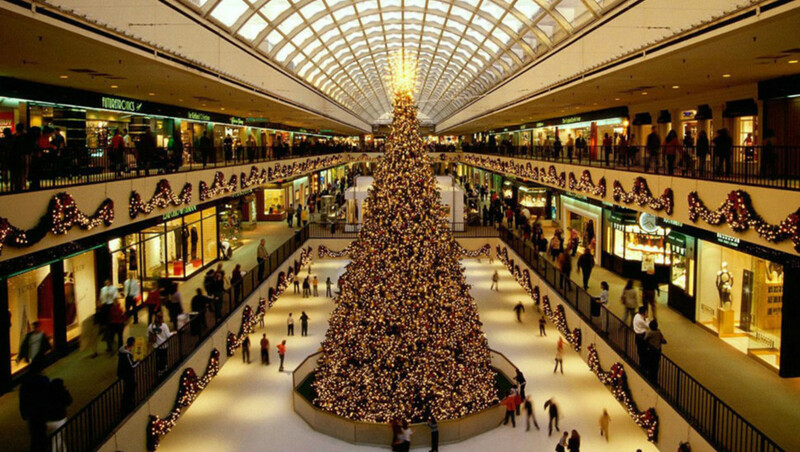 Do you enjoy going to the shops to buy Christmas presents, or find yourself veering more to online these days?